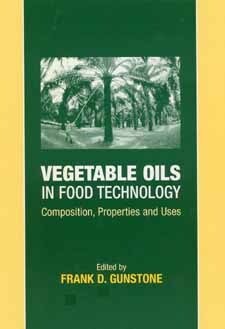 Vegetable Oils in Food Technology provides accessible, concentrated information on the composition, properties, and uses of the vegetable oils commonly found in the food industry. It includes modifications of these oils that are commercially available by means of partial hydrogenation, fractionation and seed breeding. Also, the major food uses are linked, wherever possible, to the composition and properties of the oils. Potential for Sunflower Products in the U.S.
Coconut Oil: Composition. Processing and Applications. Palmkernel Oil: Composition. Properties. Processing. Food Uses. Sesame Seed Oil: World Seed Production. Oil Composition. Seed Processing and Oil Refining. Sesame Antioxidants and Oil Stability. Health Effects and Future Research. Rice-Bran Oil: Production of Bran and Oil Extraction. Oil Refining and High Value bypsroducts. Oil Composition and Food Uses. Biological Effects and Future Trends. Flaxseed (Linseed and Linola) Oil: Flax Production and Oil Composition. Edible Uses of Flaxseed and Its Oil. Linola Oil.